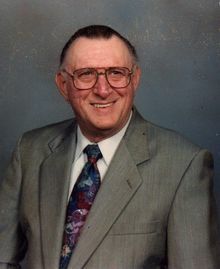 James A. Haver, son of James E and Nora (King) Haver was born May 17, 1928 in Des Moines, Iowa and died January 31, 2007 in the Ringgold County Hospital In Mount Ayr, IA. He attended Roosevelt High School before joining the U.S. Army as a paratrooper where he served in the Pacific area and occupied Japan. Jim earned an associate degree at Simpson College after which he worked for Phillips Petroleum, later working for his father in Haver Oil Company where he was Vice President, he was also a salesman for Walnut Grove, owned a Phillips Oil gas station and served 20 years as a custodian for the Mount Ayr Community School. He married Kathryn Elaine Kerr on Sept. 16, 1949, two daughters Kendra Kay and Kathleen Ann were born to this union. After the death of his wife he and Alice Packwood were married on October 20, 1972. On May 22, 1993 Jim and Lorrie Allen were united in marriage at the Mount Ayr United Methodist Church. Susvivors include his wife Lorrie of Mt. Ayr; daughters, Kendra (Warren) Anderson of Central Point, OR and Kathleen (Bill) Schuster of Mount Ayr; step-son Dave (Lorna) Allen of Colorado Springs, CO; step-daughter, Kathie Grein of Maple Grove,MN; grandchildren Malinda (Jeff) Price, Jennifer (Ross) Kinney, Kristan (Richard) Oliver, Michelle Anderson, Joshua and Amber Schuster and step-grandson Jason Grein; also 4 sisters, Maxine Russell, Lois (Les) Itken, Jan (Herb) Griffen and Eula Goodby. In lieu of flowers a memorial has been selected for the Ringgold County Hospital.